Nature is one of the best places to look for crafts inspirations. Butterflies are among the most popular because they are beautiful, delicate, brightly colored, and intricately patterned, so they are perfect for any interior decorations. 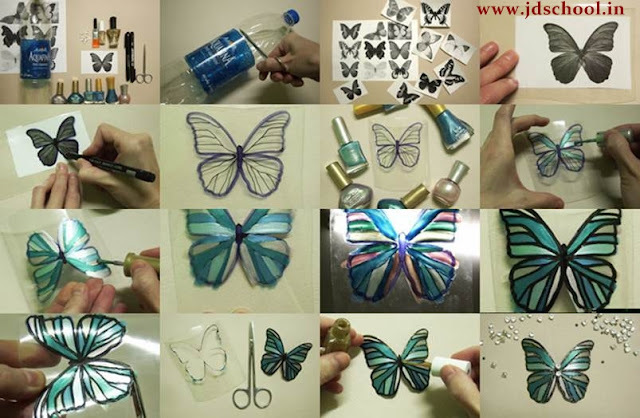 Here is a creative DIY project to make pretty butterflies with plastic bottles and beads. Plastic bottlecraft is a nice way to recycle plastic bottles. These plastic butterflies look so gorgeous with their colorful and translucent wings, and sparkling beaded body. They are very simple to make and your kids can help with the drawing and decoration parts. In this way, you can teach them the concept of recycling and reusing plastic bottles. Happy crafting! Nail polish or acrylic paint.